Can they compete with America? When it comes to establishing a foothold in the highly competitive, politically fraught Gulf market, Rosoboronexport has their work cut out for them. Nonetheless, Russia’s ambitious lineup of air defense systems and modernized heavy weapons speaks to a rising confidence in their ability to carve out a greater slice of the high-end arms market over the coming decade. Since 2010, Rosoboronexport-- Russia’s state defense export agency-- has made great strides in breaking into the Southeast Asian arms market. However, parts of the Middle-East present a much more challenging landscape. In particular, Rosoboronexport has yet to make meaningful headway in the lucrative Persian Gulf market where major defense system contracts still tend to go to the United States. The centerpiece of Russia’s exhibition was the unveiling of their new Pantsir-ME shipborne air defense system. Rosoboronexport executive Alexander Mikheev expressed optimism about its market competitiveness: “Pantsir-ME can be installed on most Russian warships and is very well fit for ships manufactured by other countries… I am confident that it has very good export prospects in the Arab countries, southeast Asia and Latin America. Boasting a unique, “completely automated” dual missile-artillery system with a range of up to 15 kilometers, the manufacturer claims that Pantsir-ME is the first seaborne defense system of its kind. 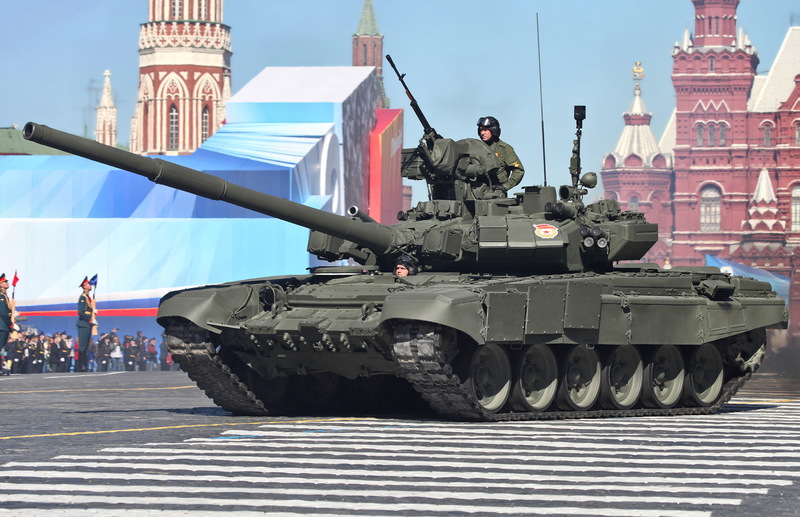 Russia’s flagship tank offering remains the T-90MS, a modernized export variant of the T-90 battle tank that served as Russia’s staple heavy armor solution through 2011. As previously covered by The National Interest, its improvements include a new onboard display, new 360-degree camera system, a more powerful 1,130 horsepower V-92S2F diesel engine, and a revised explosive reactive armor (ERA) system. These upgrades don’t come cheap, however; whereas the prior T-90 export model costs 2.5-3.5 million dollars, the T-90MS comes in at 4.5 million. Unlike its more affordable predecessors, the T-90MS is Russia’s attempt to target the higher segments of the heavy armor market. In what Russian exporters are sure to take as a positive sign of market interest, Egypt and Kuwait are on the verge of finalizing T-90MS contracts. Russia’s flagship small firearms offering is the AK200 series, a set of AK-12 variants cleared for export less than a week before IDEX 2019. The series consists of six rifles from the AK-200 to the AK-205, differentiated by compact and full-size options as well as three caliber choices: 7.62x39mm, 5.45x39mm and 5.56x45mm NATO. On the more experimental end, also making an appearance are Kalashnikov’s new KUB-BLA suicide drones. "KUB-BLA is designed to destroy remote ground targets," Kalashnikov explained at the exhibition. "An unmanned aerial vehicle delivers a special load to the coordinates of the target, which are set manually or in the image from the [drone's] guidance system." The KUB-BLA is the latest, striking example of Kalashnikov Group’s aggressive attempts to diversify beyond the small firearms industry.